You should check your tires for wear at least once a month and before and after long trips. You check them to determine whether you need to buy new tires, have your wheels balanced, have your wheels aligned, or change your driving habits. Underinflated tires wear out faster, create excessive heat, increase fuel consumption, and make your car harder to handle. Overinflated tires can “blow out” more easily, wear out faster, and make the vehicle unstable and unsafe to handle. And a new set of tires on wheels that are out of alignment can wear out completely in as little as one day of hard driving! What the signs of poor treadwear mean. Look for things embedded in each tire. Do you see nails, stones, or other debris embedded in the treads? Remove them. If you hear a hissing sound when you pull a nail, push the nail back in quickly and take the tire to be fixed. Tires with leaks should be patched by a professional. Look at the sidewalls. Check for deeply scuffed or worn areas, bulges or bubbles, small slits, or holes. Do the tires fit evenly and snugly around the wheel rims? Look at the treads. 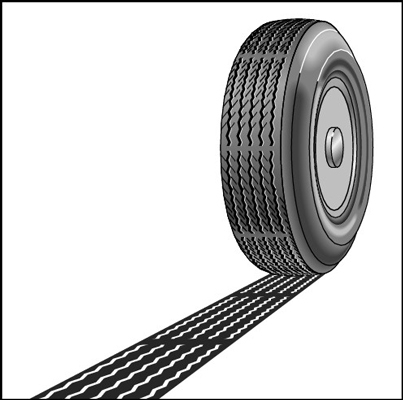 Most tires have built-in treadwear indicators. These bars of hard rubber are normally invisible but appear across treads that have been worn down to 1/16 of an inch of the surface of the tire (the legal limit in most states). If these indicators appear in two or three different places less than 120 degrees apart on the circumference of the tire, replace the tire. It’s time for new tires when treadwear indicators appear. If your tires don’t show these indicators and you think that they may be worn below legal tolerances, place a Lincoln penny head-down in the groove between the treads. If you can see the top of Lincoln’s head, your tire probably needs to be replaced. Sometimes 1/16 inch of tread isn’t enough to keep you safe. If you live in a rainy area, measure the depth of your treads with a quarter rather than a penny, using Washington’s hair to see if your tires have at least 2/16 of an inch of tread remaining. Pay attention to leaks. If you keep losing air in your tires, have your local service station check them for leaks. Sometimes an ill-fitting rim causes a leak. The service facility has a machine that can fix this problem easily. The following table summarizes tread wear and what it means. Only edges of front tires worn Taking curves too fast Slow down!